If you're out of ideas which stocks to pick next, or your favorite stocks are letting you down and the stock heat map isn't telling you much either, it may be a good strategy to start trading the stock market earnings report calendar. It's definitely a trading strategy that could work for you in this case, especially when you're having trouble finding some clear direction in the financial markets. The calendar basically shows you on what date a particular company will release its earnings report. This report says a lot about the company and the health of the industry it's active in. Then the answer to which stock to trade is pretty much already given to you, top analysts predict whether or not a stock will miss, meet or exceed expectations and estimate this on the stock market earnings report calendar. Basically, it's all a matter of probability; how likely is the stock to move in the direction of the prediction of the analysts. Usually you can see the stock trading in the presumed direction a few days before hand. 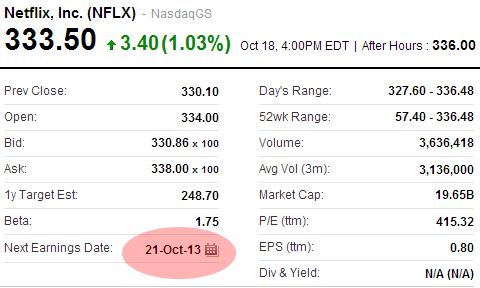 For instance, Netflix ($NFLX) will release its earnings report on Monday October 21st. Already its stock has been trading up over 1% Friday, indicating that investors have high hopes that Netflix is able to meet, or exceed its earnings expectations. Aside from the analyst forecast, another good reason to start trading the stock market earnings report calendar is volatility. Regardless whether the company is able to make money, during earning reports the stock price of that company is likely to become volatile and fluctuate a bit. This is due to traders, investors and speculators that mainly use this strategy, or people that buy this stock based on good earnings. Bear in mind that not all companies are estimated. 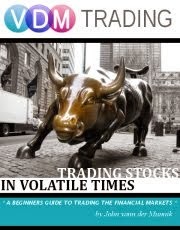 The benefits of trading the stock market earnings report calendar is that you'll be able to profit from those fluctuations, meaning that you may be able to buy a stock for a little cheaper than usual because its price had a little bit of a pullback. Another benefit is that you're sometimes able to see how the overall market in that particular sector is performing. Another example is Ford ($F), a company that's also going to release its earnings report next week (October 24st). Not only you'll see the health of Ford as a company, but it will also give a little indication on how the overall auto industry is performing. It's a great profitable strategy if you follow the trend, but keep in mind that sometimes analysts can also totally be wrong about their predictions. If they expect a company to meet or exceed its earnings report and the company misses the mark while you're blindly keep trading the stock market earnings report calendar, you might be making one of the worst investment choices of your trading career. Always use common sense, and do a lot of research beforehand. I mainly use Yahoo Finance for my calendar. Also when you look up a stock, it will usually tell you when the associated company will release the earnings report. (see below). Stock Quote courtesy of Yahoo! A lot of companies issue earnings reports this upcoming trading week. It's a great weekend to do some stock research!